Here are the Rewards Canada Top 5 Credit Card Sign Up offers for the month of February! This is not a 'best' credit card list like our Top Travel Rewards Credit Card rankings but instead a look at cards that have very good acquisition (sign up) offers. As always when choosing a card you should always take other factors into account other than the sign up bonus, but when most or all of these cards are first year free, they can and do pay off even when you grab them strictly for sign up rewards. In fact all of the cards on this list for September are first year free so you can try them out at no cost and decide later on if the card is right for you. All the while earning the sign up bonus which can be used to subsidize your travels! No change this month once again for the top 5 sign up offers for February - even with the BMO changes announced on January 15th this list focuses on the strength of the sign up offers and not so much on the day to day earn or other elements. Its pretty much about getting in on the offer and then most likely getting out once you use up the rewards from that sign up bonus. The best ever sign up bonus for an AIR MILES co-branded card continues to be in the Top 5 sign up list thanks to its 3,000 miles sign up bonus (worth ~$300 or more) and no annual fee in the first year! Even if you aren't a fan of AIR MILES the fact you can get 3,000 miles and them use them as cash rewards for no cost to you should be enough to go out and get this card. Revamped on January 15th with a reward program that is less rewards on your day to day spend the card still graces this list thanks to its sign bonus and first year free offer. The card now offer a 35,000 point sign up bonus that is worth $250 in travel and since the card is first year free right now (they bill you $150 and then rebate after several months) that means your $250 in travel is free and yes you even get the Priority Pass access and 4 lounge passes included in that first year free. 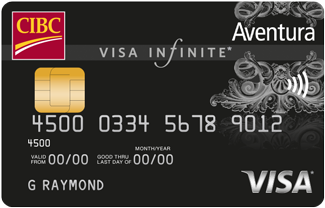 The CIBC Aventura Visa Infinite card offers a 15,000 Aventura Points sign up bonus worth anywhere from $150 to $300 depending on what type of flight you redeem for and since the annual fee of $120 (and supplementary cards are waived as well) those 15,000 points come at no cost to you. 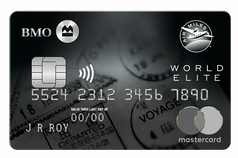 A very strong card in the earn category for Gas, Grocery and Dining/Entertainment purchases, the current sign up bonus for the Scotiabank Gold American Express Card is 25,000 points when you reach $1,000 in spending in the first three months. That 25,000 points is equal to a $250 travel credit and since this card is a book anywhere card you can book the travel how you want when you want and when the charge shows up on your account you can redeem the points against the charge. The card normally has a $99 annual fee but of course that is waived in the first year during this promotion.